Harlequins and Pierrot clowns took centre stage at Christian Dior's Haute Couture catwalk show in Paris on Monday, as models sporting ruffs, sequinned dresses and ringmaster jackets paraded through a circus tent, surrounded by acrobats. Glittering bonnets by milliner Stephen Jones and sparkling shoes added to the whimsical collection on the first day of Haute Couture Fashion Week, a celebration of high-end designers with one-of-a-kind outfits. 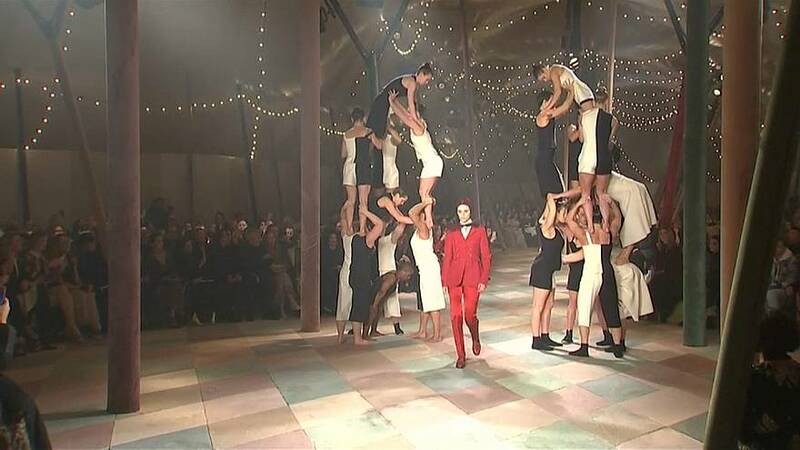 Actresses Felicity Jones and Rachel Brosnahan looked on from the front row, as the models wove their way through perilously-balanced human towers formed by the troupe of female acrobats. Standout numbers included a gold pleated evening dress with a Grecian twist.